This was an open letter circulated at a conference of International Socialism (I.S. ), the forerunner of the Socialist Workers Party, in September 1968. It was also published as a pamphlet under the title 'The Struggle For Self-Management'. 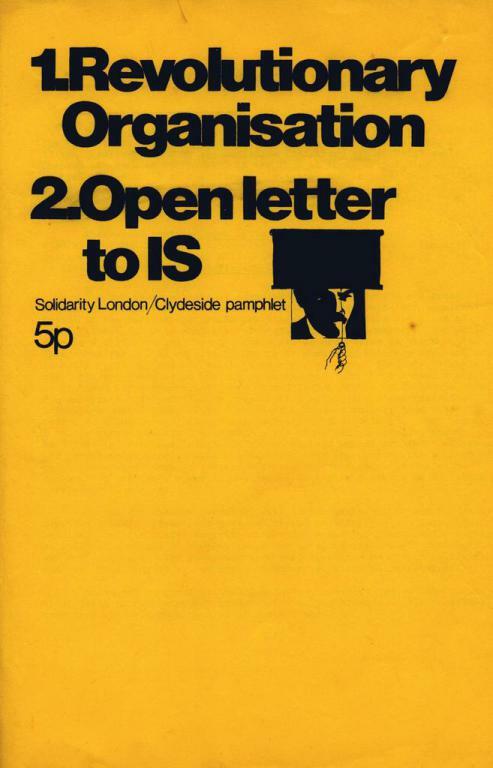 In 1972 it was reissued as part of a Solidarity pamphlet (now entitled 'Open letter to IS' dropping the word 'comrades'), together with the Solidarity (Clydeside) pamphlet 'Revolutionary Organisation'. That is already in the library here. Both the 1968 and 1972 introductions are included here. Solidarity's attitude to I.S. seems to have changed over the course of 1968 — only a couple of months before this the July 1968 issue of Solidarity for Workers' Power had contained a block advert for I.S. publications. Two members of Solidarity, John Sullivan and Tom Hillier, subsequently left to join I.S. They produced a critical pamphlet 'Solidarity Forever?'. Solidarity published a reply-pamphlet by Maurice Brinton. Both are in the library here. We have decided to republish two of our former texts as a pamphlet. The first text, on 'Revolutionary Organisation', was written early in 1961. It was first published by the Socialism Reaffirmed group (which later changed its name to SOLIDARITY) in the form of three articles which appeared in issues No. 4 and 5 of the journal 'Agitator' and in issue No. 6 of 'Solidarity' (the new name by which our journal became known from May 1961 on). In 1969 the Clydeside Solidarity group reproduced these articles as a pamphlet. The second text 'An Open Letter to I.S.' was produced in September 1968 as a SOLIDARITY (London) special. It was-distributed at the Annual Conference of I.S. in Beaver Hall. It deals with topics closely related to those mentioned in 'Revolutionary Organisation'. The two texts — although outdated in some respects — are being reproduced in response to a continued demand. We present them as a contribution to the serious discussing now taking place, within the ranks of revolutionaries, as to what kind of organisation is necessary. The whole area is a difficult one, in that there are no prototypes on which we can base ourselves. What we have to create is something entirely new, and it is not surprising that the birth pangs are prolonged. The only 'examples' available are examples of what is to be avoided. On the one hand highly centralised and hierarchically-structured organisations of Bolshevik type, run on semi-military lines, and reproducing within their own ranks the order-giver/order-taker relationships of bourgeois society (and hence the political alienation of the average person in that society). Such organisations have certainly 'succeeded' — but succeeded in bringing about societies in their own image. On the other hand we see groups so obsessed with problems of bureaucratic degeneration that they refuse the minimum of organisation necessary to provide a framework for democratic decision-taking. To hold such views is tantamount to saying there is no socialist perspective whatsoever. On the one hand we certainly wish to influence others and to disseminate SOLIDARITY ideas (not just any ideas) as widely as possible. This requires the coordinated activity of people or groups, individually capable of self-activity and of finding their own level of involvement and their own areas of work. The instruments of such coordination should be flexible and vary according to the purpose for which coordination is required. There are no institutional guarantees, however, against the bureaucratisation of revolutionary groups. The only guarantee, is the perpetual awareness and self-mobilisation of their members. This text was first produced as a 'Solidarity' publication in September 1968, under the title 'An Open Letter to I.S. Comrades'. The occasion was the National Conference of 'International Socialism' (I.S.) being held at the Beaver Hall, London. The gathering was the first I.S. Conference after the May 1968 events in France, which proved a turning point for so many revolutionary groupings in the West. Until that date I.S. was more open-minded than most other organisations of the Left, being neither doctrinaire nor authoritarian. As a result of the events of May 1968 the ranks of I.S. swelled with eager, militant youth, awakening to political action. The response of the group's Executive Committee was an attempt to impose the authority of the central bodies over the rank and file. In a duplicated document, dated September 12, 1968, and headed 'Perspectives for I.S.' the Executive Committee proposed certain organisational principles to the Conference including one proclaiming that 'Branches must accept directives from the Centre'. These proposals met such opposition during the Conference that the Executive Committee had to withdraw them without even attempting to defend them. They disappeared just as they had appeared, only to be implemented in a much more gradual and slow process of sifting 'responsible' comrades and electing them to 'responsible' positions. The truth is that the Leninist faction in I.S. (just like the Leninist faction in the Bolshevik Party) stands or falls with the organisational and ideological principle of the absolute rule of the Centre over the rest of the party (and of the party over the rest of the working class). It would, however, be erroneous to attribute the principle of the rule of the Central Political Bureaucracy — and the idea of its right and duty to make political decisions 'on behalf of' the rest of the party — to the machinations of that bureaucracy alone. Hierarchical leadership feeds on the readiness of the led to be led. It soon transpired that many I.S. comrades wanted a Centre that would take political decisions on their behalf. The historical, organisational and ideological arguments supporting this principle can easily be shown to be rationalisations rather than proofs of the belief that 'not every cook can govern'. It is the acceptance of this principle that provides the basis for both bourgeois democracy and for its 'revolutionary' counterpart: democratic centralism. The total and systematic rejection of this idea, wherever it manifests itself, singles out Solidarity's ideas on society, revolution, socialism (and on the role and structure of revolutionary organisations) from those of all other revolutionary groups in Britain. Our insistence that every cook can, should and must govern is not merely a desirable distant goal. It is something which must be implemented today within every unit of the revolutionary movement and at every level of social activity. We believe that this is what the revolution, and socialism, are all about. It is remarkable how few socialists seem to recognize the connection between the structure of their organization and the type of 'socialist' society it might help bring about. If the revolutionary organization is seen as the means and socialist society as the end, one might expect people with an elementary understanding of dialectics to recognize the relation between the two. Means and ends are mutually dependent. They constantly influence each other. The means are, in fact, a partial implementation of the end, whereas the end becomes modified by the means adopted. One could almost say 'tell me your views concerning the structure and function of the revolutionary organization and I'll tell you what the society you will help create will be like'. Or conversely 'give me your definition of socialism and I'll tell you what your views on the revolutionary organization are likely to be'. We see socialism as a society based on self-management in every branch of social life. Its basis would be workers' management of production exercised through Workers Councils. Accordingly we conceive of the revolutionary organization as one which incorporates self-management in its structure and abolishes within its own ranks the separation between the functions of decision-making and execution. The revolutionary organization should propagate these principles in every area of social life. Others may have different conceptions of socialism. They may have different views on the aims and structure of the revolutionary organization. They must state what these are clearly, openly and unambiguously. They owe it not only to the workers and students but to themselves. An example of haziness in the definition of socialism (and of its repercussions concerning revolutionary organization) is to be found in the material published by the central bodies of International Socialism (I.S.) in preparation for the Bi-annual Conference of September 1968. In the duplicated 'Statement of Basic Principles' (I.S. Constitution) we find that I.S. struggles for 'workers' control'. But we also find that 'planning, under workers' control, demands nationalization'. These are the only references, in the document, to the structure of the socialist society towards whose creation all of I.S. activity is directed. How, precisely, does I.S. conceive of working class 'control'? What does 'nationalization' mean? How does I.S. relate it to 'workers' control'? Does the working class implement its 'control' through the mediation of a political party? Or of trade union officials? Or of a technocracy? Or through workers councils? Are those who formulated the I.S. Constitution aware that 'nationalization' means precisely relegating authority of decision-making on industrial policy to a group of state officials? Don't they realise that the struggle of the French students and workers for 'auto-gestion' (self-management) renders 'nationalization' irrelevant? Apparently they do not. In the analysis of the French events ('The Struggle Continues') written by T. Cliff and I. Birchall (and produced as an official I.S. publication) the relation between self-management and nationalization is not discussed at all. Why should a national federation of Workers Councils (composed of elected and revocable delegates of regional Councils) allow any other group in society to wield ultimate authority in relation to all aspects of production? In political terms the question can be posed thus: does I.S. stand for the policy of 'all power to the Workers Councils'? Or does it stand for the policy of 'all power to the Revolutionary Party'? It is no use evading the issue by saying that in France no workers councils existed. When this is the case, it is the duty of revolutionaries to conduct propaganda for their creation. However one analyses Lenin's transition, in the context of Russia in 1917, from a policy of 'all power to the soviets' to a policy of 'all power to the Bolshevik Party', one must recognize that his choice was a fundamental one, whose implications for Britain in 1968 cannot be evaded. The 'leading' (i.e. decision-making) bodies in I.S. are very careful not to state explicitly that, like Lenin, they believe that the Party must take power on behalf of the class. This principle however runs through the entire Cliff-Birchall analysis of the French events. Their analysis is, in fact, tailored to fit this principle. We say to these comrades: if you believe that the working class itself cannot 'seize power' (but that the Revolutionary Party must do it on behalf of the class), please say so openly and defend your views. Let us put to you our own views on the subject. Political 'power' is fundamentally little more than the right to take and impose decisions in matters of social production, administration, etc. This authority is not to be confused with expertise. The experts give advice, they do not make the decisions. Today, during the development of the self-management revolution, it is precisely the authority of decision-making in relation to the management of production (whether the means of production be formally in the hands of private bosses or of the state) that is being challenged. The challenge is being repeated in all branches of social life. Those who think in terms of 'seizing power' unwittingly accept that a political bureaucracy, separate from the producers themselves, and concentrating in its hands the authority of decision-making on fundamental issues of social production must be a permanent social institution. They believe its form (the bourgeois 'state apparatus') has to be changed. But they refuse to question the need for such a social institution. They want to capture political power and use it for allegedly different purposes. They do not consider its abolition to be on the agenda. As for us, we believe that once self-management in production has been achieved, 'political power' as a social institution will lose both its social function and justification. To speak of 'workers' control' and of 'seizing political power' is to confuse a new structure of society (the rule of the Workers Councils) with one of the by-products of the previous form of class society, which was based on withholding from the workers the right to manage. Comrades Cliff and Birchall fail to recognize the specific, new features of the May events in France. They fail to explain why the students succeeded in inspiring 10 million workers. 'The student demonstrations created an environment in which people were free to coin their own slogans' ('The Struggle Continues', p. 17.) Wha.t slogans? The two most important were 'Contestation' and 'Auto-gestion' (self-management). What was being contested? What does self-management mean? How are the two slogans related to each other? Not a word on all this. What we do find however is the important statement (ibid, p.18) that 'when a worker went to the Sorbonne he was recognized as a hero. Within Renault he was only a thing. In the University he became a man'. Comrades., you should seek to clarify this assessment (with which we agree). Please tell us what was the mysterious element in the 'environment' which transformed a man into a thing and vice-versa? Are we wrong in assuming that a man feels like a 'thing' when he has to live as an executant of social decisions which he cannot influence, whereas he feels like a 'man' when he lives under social circumstances which he has shaped by his own decisions (or in whose creation he was an equal partner)? Isn't the Political Committee attempting to transform I.S. members from 'men' into 'things'? Isn't the attempt to limit the right of rank-and-file I.S. members to initiate political decisions — while democratically permitting them to debate (not overrule!) the directives of the Centre, after having carried them out — an indication of an ideological disease more serious than being out of touch with the spirit of the young workers and students? If I.S. is to play a significant role in the revolution this regulation must be defeated, not only organizationally but also ideologically. This is to confuse the technical and the political aspects of a real problem. Coordination is essential and may require centralisation. But the function of an administrative centre should not include the imposition of political decisions. This approach reveals a very definite view concerning the role of the Centre in relation to the Party and of the Party in relation to the class. But it is wrong to identify this view with Stalinism. It preceded Stalin, Lenin end Marx. As a matter of fact, it has been part of ruling class ideology for centuries. Cliff and Birchall mobilise every possible argument to support the doctrine of 'Centre leads Party, Party leads class'. They write: 'Facing the strictly centralised and disciplined power of the capitalists, there must be no less centralised and disciplined a combat organization of the proletariat', (ibid, p.77) Yet two pages earlier they had admitted that 'the 14th July 1789 revolution was a spontaneous act of the masses. The same was true of the Russian Revolution of 1905 and the February 1917 Revolution', (ibid., p.75) In other words they admit that two of the most centralised regimes in history were overthrown by masses that were not led by any party, let alone a centralised one. How do they reconcile these facts with their assertion that 'only a centralised party can overthrow centralised power'? The conscious factor in changing history, embodied in revolutionary organizations, can play a significant role in shaping the new social structure. However after the Russian experience it is clear that this 'conscious factor' must develop its own self-consciousness. It must recognize the connection between its own structure and practice — and the type of socialism it will help achieve. We can only add here what Rosa Luxemburg, answering Lenin, said in 1904: 'Let us speak plainly. Historically, the errors committed by a truly revolutionary working class movement are infinitely more fruitful and valuable than the infallibility of the cleverest Central Committee'. 5 Are these words less relevant in 1968 than they were in 1904? Today in Britain the danger is not that future society will be shaped in the image of a bureaucratic revolutionary organisation based on 'genuine concentration of leadership in the hands of responsible central and local bodies, stable in their composition', organisations in which 'branches must accept directives from the Centre', etc. The danger is rather to such organisations themselves. They will cease to be relevant to the social self-management revolution now developing. Before long they will be identified as just other 'centre-managed' political bureaucracies, to be swept aside. This is the fate now threatening I.S., should the Political Committee's recommendations be accepted. We wish all I.S. members a useful Conference and a serious discussion that will help them clarify their ideas about socialism, workers' management and the structure and function of the revolutionary organisation. 1. Lenin, Collected Works, vol. 25, p. 154. 2. Lenin, Collected Works, vol. 26, p. 19. 3. I. Deutscher, 'The Prophet Armed', O.U.P., 195^, p.76. 4. Lenin, 'One Step forward, Two steps back', Selected Works, vol. II, pp. 447-448. 5. R. Luxemburg, Leninism or Marxism, Ann Arbor Paperback (1961), p.108.